In Yemen's War, U.S. 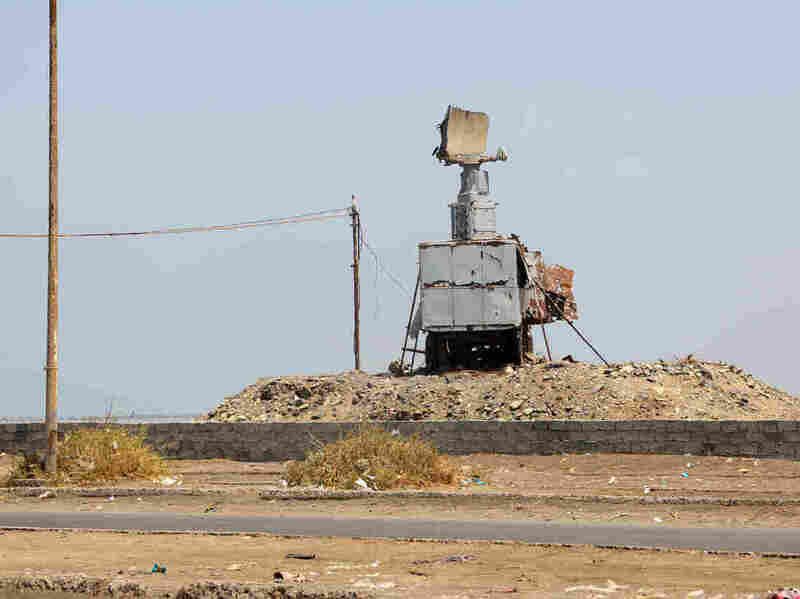 Fires Back But Plays Down Direct Involvement : Parallels Despite the U.S. strike, the Obama administration still hopes to keep America's role in Yemen's war offshore, with Saudi Arabia and other Arab militaries doing the actual fighting. A destroyed vehicle bearing a radar antenna is pictured in the Yemeni port city of Hodeidah on Oct. 13. The U.S. military directly targeted Yemen's Houthi rebels for the first time, hitting radar sites controlled by the insurgents after U.S. warships came under missile attacks twice in four days. Someone is trying desperately to pull the United States directly into the civil war in Yemen — and Washington is trying desperately to stay out. U.S. Navy ships off Yemen's southwestern coast came under missile attacks twice in four days this week, including an incident Wednesday. The U.S. military responded by firing its first public shots into Yemen on Thursday, but the Obama administration was keen to stress that they were acting for their own safety. By firing back, the U.S. was not escalating its involvement in Yemen beyond its current role as a patron to some of the combatants. "These limited self-defense strikes were conducted to protect our personnel, our ships and our freedom of navigation in this important maritime passageway," said Pentagon press secretary Peter Cook. American officials signaled there would be no new cruise missile or airstrikes against targets controlled by anti-government Houthi forces. There appeared to be no major change in the works to Washington's policy of supporting Saudi Arabia's military. The problem is that the Saudi bombing campaign has killed many Yemeni civilians with U.S.-built weapons dropped from U.S.-made aircraft, refueled by U.S. Air Force tankers and supported by U.S. intelligence. A bloody airstrike last weekend killed about 140 people at a funeral in Yemen's capital, Saana, and prompted a condemnation by the White House. "U.S. security cooperation with Saudi Arabia is not a blank check," said Ned Price, a spokesman for the National Security Council. But there's been no actual break in support. That attack on the funeral may have been what led someone — possibly the Houthis — to try to punish the Americans for their involvement and bring them fully into the war. The Pentagon said the Navy destroyer USS Mason was targeted by anti-ship missiles fired from shore in areas under Houthi control. The attacks missed, either on their own or because they were intercepted by the Mason's defensive systems. But the threat to American sailors and international shipping was too grave for Washington to ignore. So President Obama ordered another destroyer, the USS Nitze, to destroy three radar sites in Yemen that the Pentagon said had been used in prior missile attacks. The danger was not theoretical. On Oct. 1, an anti-ship missile fired from Yemen destroyed a ship operated by the United Arab Emirates. By framing the U.S. response as a matter of self-defense and freedom of the seas, the Obama administration hopes to keep America's role offshore, with Saudi Arabia and other Arab militaries doing the actual fighting. The question now is whether the party that fired the missiles will give up or try again with more attacks or in a different way. Also unclear is whether the attacks were directed by the top leaders of the Houthis or the Iranian forces helping them or by subordinates – and whether those subordinates might be rewarded or punished. For the record, Houthi leaders have denied the attacks on the U.S. The Pentagon insists the missiles were launched from Houthi-controlled territory. If Yemenis didn't actually pull the trigger, then who did? Throughout the war in Yemen, there have been conflicting claims about Iran's role in the conflict. Tehran has denied Saudi and U.S. accusations that Iran is supporting Houthi forces. But Iran's Quds Force and Revolutionary Guards Corps have spent years undermining American forces in the Middle East. They supplied deadly roadside bombs to insurgents in Iraq. Their boats zip dangerously close to American warships. The C-802 anti-ship missiles fired against the Emirati ship and the American destroyer Mason are a well-known part of Iran's toolkit. Tehran has also given them to its ally Hezbollah in Lebanon, which used one to damage an Israeli warship off Beirut in 2006. More recently, American and other allied warships have stopped several shipments of weapons from Iran to the Houthis. In March, for example, the Navy said forces from the destroyer USS Gravely and patrol ship USS Sirocco boarded a dhow carrying some 200 rocket propelled grenades, scores of machine guns and Kalashnikov rifles stacked up like cordwood. Even then, Washington was anxious about calibrating the level of its involvement – the American sailors seized the weapons but let the smugglers go.